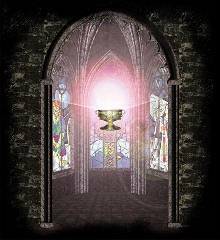 The Grail, according to my own interpretation, is the goblet used at the Last Supper in which Joseph of Arimathea caught the Saviour's blood on the Cross. 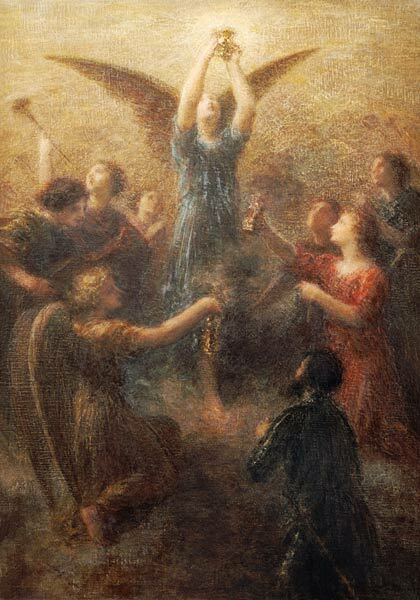 Left: Henri Fantin-Latour: The Grail (Prelude to Lohengrin), 1892.
he legends of the Holy Grail are woven of three strands: a Celtic tradition of otherworld vessels and supernaturally powerful weapons; an Arabic or Byzantine tradition of a mysterious stone that had fallen from the heavens; and a Christian tradition, perhaps of Gnostic or heretical origin, of a mysterious talisman. essie Weston held the view that there lay at the root of the Grail tradition, the rites of a secret mystery cult. 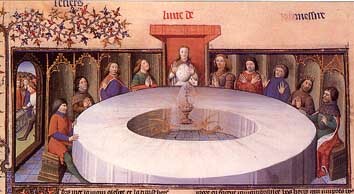 The Grail might have been a sacramental dish of the kind used in the Orphic tradition and apparently taken over by the Christian Church; this possibility is explored in the fourth volume of Joseph Campbell's The Masks of God. Miss Weston also suggested that the Bleeding Lance, carried by a squire, and the Grail, carried by a maiden, must have been originally symbolic elements of a classical mystery rite. 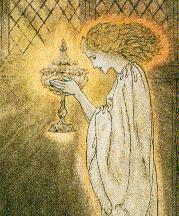 oomis held the alternative view that the origin of the Grail legends was Celtic. The Celtic gods of the Underworld or of the Land Beneath the Waves (Nodens or Nuadua, Gwynn ap Nudd, Manannnan Mac Lir, Bran the Blessed) possessed magic vessels of inexhaustible ambrosia and were to be found in mysterious castles hidden in mist, surrounded by water or by impenetrable forest. Right: this carving from Jaén Cathedral shows an oriental or Moorish philosopher and an occidental knight with a stone that fell from Heaven. olfram's Parzival contains passages that reveal a knowledge of events in the Levant, as might have been told by returning crusaders. Indeed, Wolfram claims to have taken his subject matter from a book given to him by Philip, Duke of Flanders, who had been in those lands in 1177. He also cites as a source a certain mysterious Kyot, who provided him with further material from the south of France or perhaps Moorish Spain (and the Kabbalah of the Spanish Jews). So there are Arabic and other exotic elements in Wolfram's story that do not appear in his primary source, Chrétien's unfinished poem. n Wolfram's account, the Grail is a stone that fell from the heavens. It is by the power of this stone that the phoenix rises from the ashes. 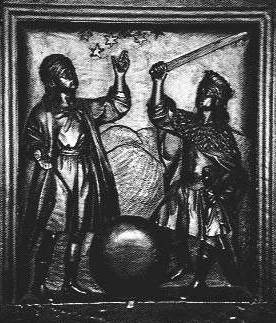 Hence Wagner's reference to the meteoric stone in the mosque at Mecca. ith the appearance in 1136 of The History of the Kings of Britain, an extraordinary book written by Geoffrey of Monmouth, the names of the mythical hero Arthur and the mythical wizard Merlin became inseparably linked. The book became the medieval equivalent of a best seller, with an enormous number of copies being made (in an age before the printing press) and circulated throughout western Europe. Many adaptations and paraphrases were made in Latin prose and verse, and then vernacular versions appeared in Old English, Old French or Welsh. The characters and ideas of Geoffrey's book were developed by French writers, such as Marie de France and Chrétien de Troyes. 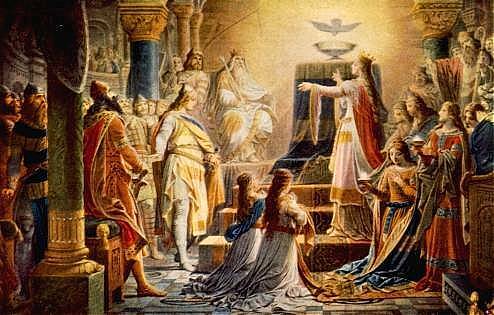 Other tales were related to the court of Arthur: these included the love story of Tristam and Yseult or Tristan and Isolde (of which the earliest version appeared around 1150) and the story of the Grail and its guardian, the Fisher King. Copyright J. Horner, by permission. he first of these phases was concentrated on Arthur and Merlin, in the books written by Geoffrey of Monmouth and the French cleric Wace. In the second phase, the focus moved to the knights of Arthur's court, including Perceval and Gawain, whose adventures were described in Chrétien's Perceval ou Le Conte du Graal. R.S. Loomis and other scholars have argued that, in view of the differences and similarities between the story of Peredur in the Mabinogion and the French works, both Perceval and Peredur son of Evrawc must have derived from a common predecessor, probably written in French, which has been lost without trace. Campbell speculated that there was at this time an entire body of tales based on Celtic (Welsh and Irish) myth. These "folk materials" were to be developed into first oral and then written epics. the Vulgate Cycle (1215-1230, according to R.S. Loomis), including L'Estoire del Saint Graal and La Queste del Saint Graal, in which the Grail is a dish. n the final phase, the literature of the Holy Grail reached its apogee in the work of the poet-knight Wolfram von Eschenbach. As Oswald Spengler pointed out, it was with Wolfram that western civilisation arrived at a mythology of inwardly motivated quest, directed from within: the tragic line of the individual life develops from within outward, dynamically, functionally . n one of the so-called Continuations to Chrétien's Perceval, probably written about 1230, the Fisher King reveals that the bleeding spear is the lance that pierced the side of Christ and that the Grail is the cup in which Joseph of Arimathea caught the blood of Christ. 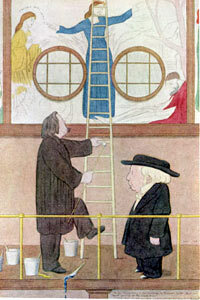 This interpretation is also described in Robert de Boron's Joseph d'Arimathie, finished about 1199. There is one element of Robert de Boron's story that found its way into Wagner's story although it does not appear either in Chrétien or the Continuations: the Grail ceremony induces pain in any sinner present. None of this is found in Wolfram and it may be supposed that Wagner had read a text that referred to, or summarised, Joseph d'Arimathie. 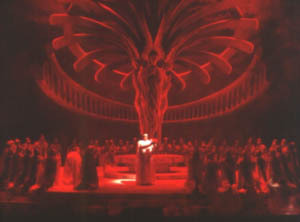 Left: Parsifal Act 3, Washington Opera 2000. Production and designs by Roberto Oswald. ©Washington Opera. Left: The Grail is uncovered at the end of the opera, in a NY Met production. agner was familiar with the work of contemporary scholars on the sources of Wolfram's epic but dismissed his interpretation of the Grail as a stone brought to earth by angels. Wagner adopted the Christianised version of the Grail but discarded the Question entirely, made the recovery of the spear the focus of the story and changed some of the names from those found in Wolfram's poem. Many other elements he used, however: such as the election of those who might find their way to the Grail, the life-preserving power of the Grail and the descending dove. And what exactly were they going to do with this Grail when they found it, Mr. Rossetti?